On Saturday, the junior high youth (and some of their brave parents) hiked the Arizona Trail. 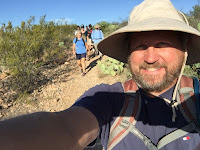 The hike started at the Gabe Zimmerman trail head - near the three bridges crossing along Marsh Station Road. The hike was beautiful. The beginning of the hike takes you through a portion of Cienega Creek. Unfortunately, there was no water in the creek, but it is still very green and beautiful. After passing under the trestle train bridge, the trail heads off to the north out of Cienega Creek and crosses Marsh Station Road. There is a pedestrian crossing complete with warning lights, but there wasn't much traffic that early in the morning. 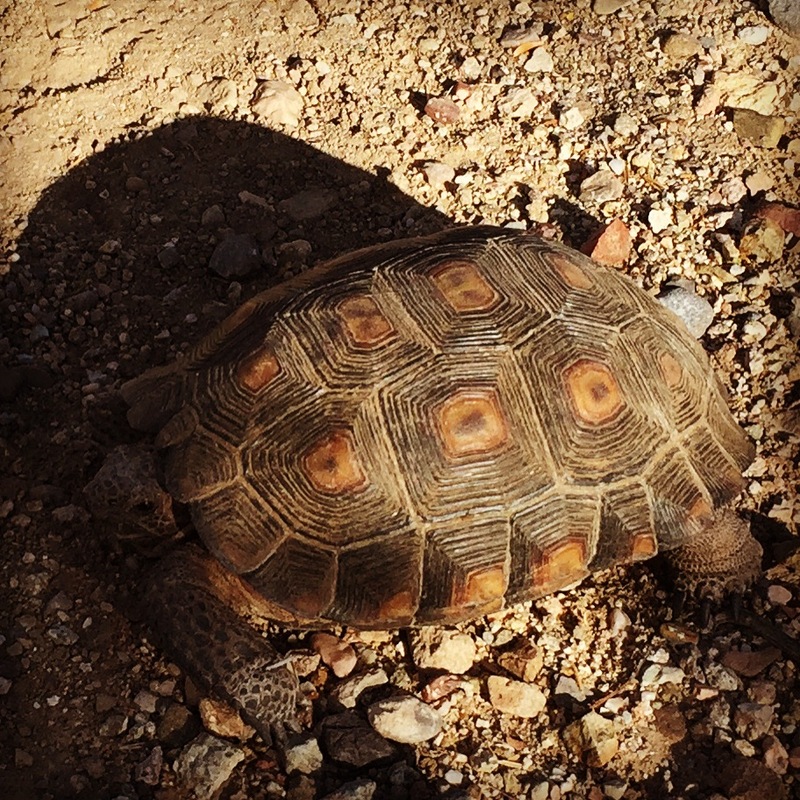 A desert tortoise on the trail. After crossing, the group watched a train go by. Even in middle age, I still get a kick out of watching trains. We then met a friend on the trail. 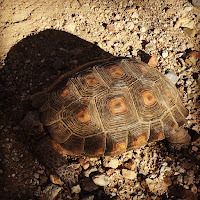 It was a small desert tortoise about 12" long. After taking a few pictures, we left him and continued our hike. The next hour was rather uneventful. There isn't much shade and as the morning sun started to get higher into the sky, the temperature began to rise. Fortunately, we all were prepared with lots of water. 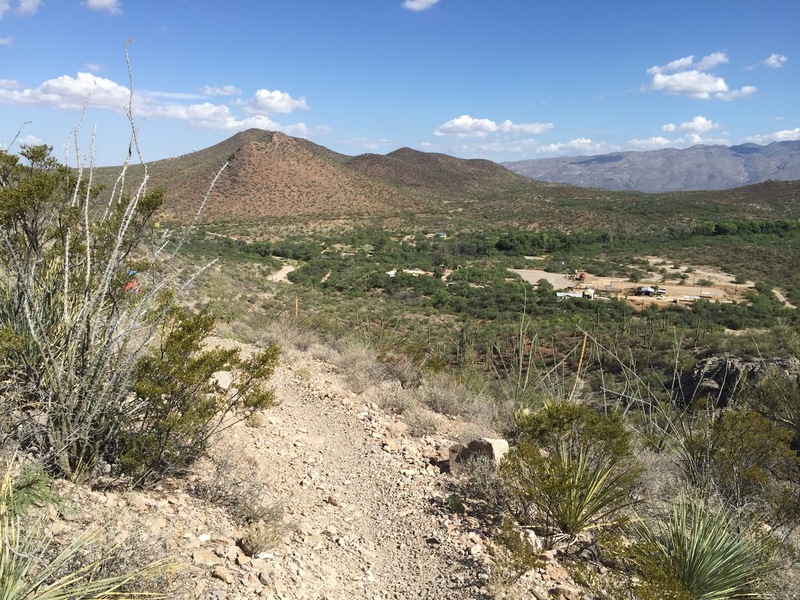 We climbed into the saddle that overlooks Posta Quemada Ranch. What a sight! Even though it still takes another 30 minutes to get to the ranch, it doesn't seem as bad since it's all downhill. After arriving at the ranch, we all ate donuts, fruit and other fine breakfast food. Overall, it was a beautiful morning. I am always amazed that such a beautiful portion of the world is so close to Vail. Thanks God for such a beautiful creation and a safe morning!